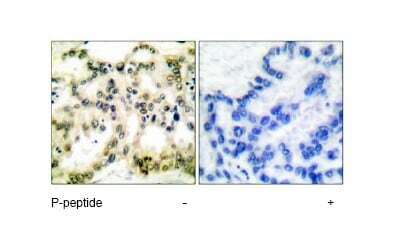 Rabbit polyclonal Cyclin B1 (phospho S126) antibody. Validated in WB, ELISA, IHC, ICC/IF and tested in Mouse, Human. Cited in 5 publication(s). Immunogen corresponding to synthetic peptide. 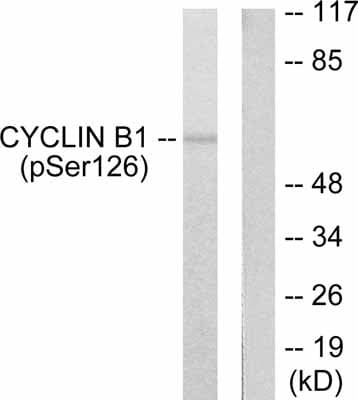 ab55184 detects endogenous levels of Cyclin B1 only when phosphorylated at serine 126. Synthetic peptide corresponding to Human Cyclin B1 (phospho S126). Synthetic phosphopeptide derived from human Cyclin B1 around the phosphorylation site of serine 126 (T-A-SP-P-S). human lung carcinoma tissue, extracts from NIH/3T3 cells, treated with EGF. Our Abpromise guarantee covers the use of ab55184 in the following tested applications. WB 1/500 - 1/1000. Detects a band of approximately 65 kDa (predicted molecular weight: 48 kDa). Accumulates steadily during G2 and is abruptly destroyed at mitosis. Cytoplasm. Nucleus. Cytoplasm > cytoskeleton > centrosome. treated with EGF (200ng/ml, 15mins). treated with EGF (200ng/ml, 15mins); ab36621 pre-incubated with the immunising phosphopeptide. Immunohistochemical analysis of Cyclin B1 (phospho S126) expression in paraffin embedded human lung carcinoma tissue using ab55184 at 1/50 dilution (left). Right hand panel represents a negative control where ab55184 was pre-incubated with the immunising (blocking) phosphopeptide. Publishing research using ab55184? Please let us know so that we can cite the reference in this datasheet. There are currently no Customer reviews or Questions for ab55184.